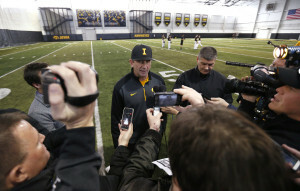 For the second time in three years the Big Ten is sending five baseball teams into the NCAA Regionals and the rise of the conference on the diamond is not a surprise to Iowa coach Rick Heller. The fourth year Hawkeye mentor watched it begin while he was the head coach at Indiana State. First it was the Big Ten Network and the additional funding it provided was helping schools boost their baseball facilities. Second was the addition of Nebraska and the tradition rich Husker program that brought with it two recent trips to the College World Series. The Hawkeyes are the fourth seed in a regional in Houston after winning the Big Ten Tournament and play the top seeded and host Cougars on Friday. Regular season champion Nebraska is the second seed at a regional hosted by Oregon State. The Huskers open Friday against third seeded Yale.